The gaming news just keeps on coming, as just moments ago @VizionGamer gave us the heads up of the English translation for the side scrolling action adventure game on the SNES ' 3x3 Eyes : Juuma Houkan '. Released only in Japan in the mid 90's and developed by Banpresto, this game is based on the 3×3 Eyes manga and OVA and puts you in control of Yakumo. You must travel around various parts of Hong Kong and other areas to prevent the resurrection of an evil beast! In terms of the game play, it is a side scrolling action adventure that requires the player to solve puzzles, talk to characters to gather information, pick up items and fight big menacing creatures. Overall a very nice game with fluid animations and plenty to do, that has been made that much more enjoyable globally as it is now in complete English. 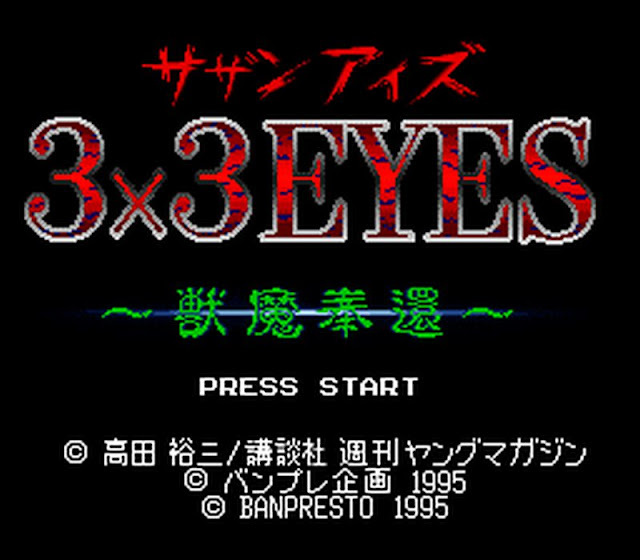 A patching program such as beat or Floating IPS will be needed to add the hack/patch to the main No-Intro Name: 3x3 Eyes - Juuma Houkan (Japan) Rom, which isn't available here.